The Vendy Awards come to Governor's Island on Saturday. KEEP ON TRUCKIN’: You already have your ticket for the Vendy Awards, right? ’Cause it’s (surprise!) sold out—but it’ll still be a scene, as at least two trucks (NY Dosa and Treats Truck) will be parking outside Vendy HQ and hawking their wares (we even bet the lines will be shorter there). And inside? 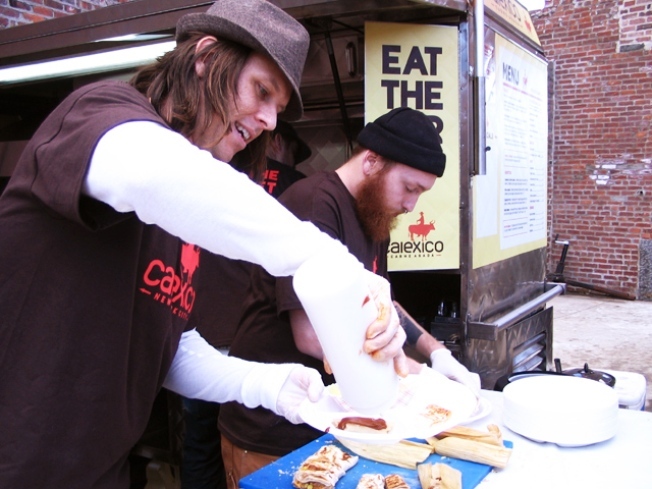 NYC’s Eat Fleet—from Calexico to the Red Hook Ballpark Vendors—will throw down to win it all. Governors Island, Saturday, 12-5PM. SWAP: Call it a culinary Freaky Friday—on Sunday—as Aldea chef George Mendes scoots a few of his friends into the kitchen for a challenge: Some of NYC’s most revered pastry chefs, like Johnny Iuzzini of Jean-Georges and Le Bernardin’s Michael Laiskonis, will try their hand at preparing savory courses inspired by dishes on the Aldea menu, while Mendes do the honors for dessert. The five-course extravaganza includes wine pairings from Bayfield Importing, with champagne from Duval Leroy. Tickets here. Sunday, 6PM. LET’S GO CRAZY: Doves will cry, fog machines will churn, lace ruffles will envelop the Lower East Side: Purple Rain, arguably the most terrible movie with the best soundtrack of all time, lands at the Sunshine Theater for midnight screenings Friday and Saturday. 12AM.